If you could not attend the meeting, please click the links below to view video coverage of the entire event. A printed summary of the event may be downloaded by clicking the link below. 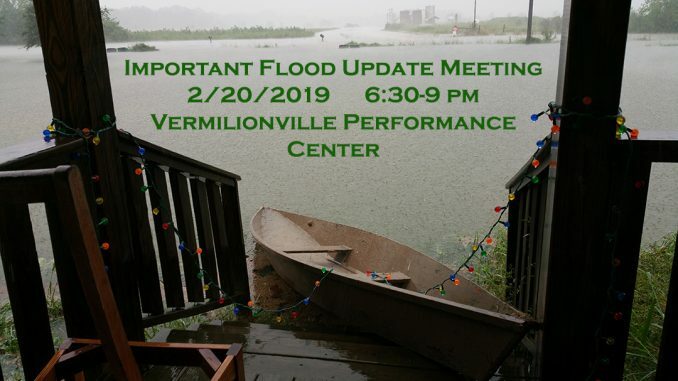 No More Flood Meeting Part one. Below is the original meeting notice. Please join us to find out what has been learned and accomplished since the last meeting. Vermilionville will host a cash bar and will sell Jambalaya to attendees. Dave Dixon, Sr. Volunteer for the flood study and Citizens for Flood Prevention. Dr. David Cheramie, Director of the Bayou Vermilion District. Bill Fontenot, ST. Landry Parish President and Chair of the Acadiana Planning Commission. Rachel Godeau, Assistant Director of the Acadiana Planning Commission. Jim Wascom, Director of the Governor’s Office of Emergency Preparedness.